If someone were to read this passage from a recent speech given by Ethiopia’s Prime Minister Meles Zenawi at the Conference of Hydropower for Sustainable Development, one would think that he was talking about foreign governments withholding aid money. Or maybe some neocolonial force that was trying to stop Ethiopia’s economic development. 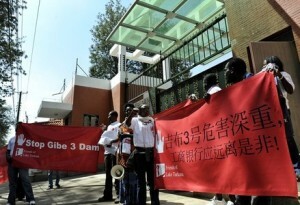 However, he was not referring to foreign governments or neocolonial forces; he was referring to groups like AJWS grantee Friends of Lake Turkana who have been tirelessly advocating against the building of the Gibe III dam in Ethiopia. If built, this dam would destroy the livelihoods of the people who live on the shores of Lake Turkana in Kenya—people who already struggle to survive and have been marginalized for generations. The dam would slowly drain the waters of the Lake, depriving indigenous communities of their source of water, food and livelihood. Numerous studies, such as this January 2011 report by International Rivers, clearly show that the impact assessments of the project were flawed. The dam violates numerous Ethiopian and international laws and it will have disastrous effects on Lake Turkana’s communities. Prime Minister Zenawi is under the impression that all organizations advocating for resource rights in Africa are from the West. For many years, resource rights issues in Africa were taken up by large US or Europe-based environmental organizations, but this is quickly changing. Just like Friends of Lake Turkana in Kenya, other locally-based organizations such as Save My Future Foundation in Liberia and the National Association for Professional Environmentalists in Uganda are grassroots organizations that are fighting battles against governments, multinational corporations, and other powerful actors to ensure they have local control over their natural resources. Although they are fighting an uphill battle, Friends of Lake Turkana and the groups that they are working with have achieved some very important victories. Many of the dam’s initial funders, such as the African Development Bank, World Bank, European Investment Bank and, most recently, the Italian Development Corporation have all withdrawn financial support of the project. The only country that continues to support the project is China—a country that has recently received a great deal of negative press about their investment practices in Africa. Friends of Lake Turkana is a concrete example of how local communities can successfully fight for their rights from the ground up. Although they still have work to do, they have shown that indigenous communities, no matter how marginalized or remote they may be, can stand up to foreign governments, international organizations and companies to achieve results.